C-Temp International is manufacturer of thermocouples, RTDs and temperature sensor assemblies serving the military industry. Our forte is providing custom tailored military temperature sensing solutions to meet the defense industries specialized needs; quickly, and affordably. We have supplied prime and sub-prime OEM contractors supplying the military industry with customized thermocouples, thermocouple assembles, RTD assemblies, and thermistor assembles for sensing engine, gearbox and power system temperatures. Military thermocouple usages can vary depending on their application and their environment in which they are required to operate in. Some of the military thermocouple applications we receive are for avionics, engines, transmissions, gear boxes, missile guidance and control systems. The basic function of the thermocouple is to monitor the operating temperature of a mechanical or electronic device to prevent an over-temperature condition from escalating to a critical system failure. Since thermocouples are rugged, versatile and economical, they are well suited for the operational demands of the military including their ability to survive the harsh environmental elements. One of the primarily environmental obstacles is the shock and vibration extremes accompanying the use of military vehicles and aircraft. One of our military customers who manufacturers UAVs for the Dept. of Defense, uses a custom designed thermocouples to monitor engine temperature. This design was required to meet MIL-STD-810 (shock & vibration) because it was subjected to constant vibrations from air travel and significant shock from landing. As a point of interest, thermocouples had a military standard (MIL-STD-687) developed in 1973 to address and formalize identification marking and color coding for thermocouples and wire. However, this was cancelled in January or 2000 for reasons unbeknown. As of late, we are unaware of any new standard which has taken its place. Military RTDs can be used in in many of the same military applications as a thermocouple. The primary advantage of an RTD is its accuracy. The RTD’s accuracy is in the range of ±0.001°F to 0.1°F in comparison to ±1°F to 10°F for a thermocouple. The RTD is very sensitive to temperature changes which are beneficial if tight temperature tolerances are essential to the application. Another feature of an RTD is its stability, the RTD has a <0.1% error readings over a 5 year period. In addition, the resistivity is linear which allows for best accuracy in calibrating temperature measurements accurately. Some of our military RTDs can be found in fuel system, hydraulics, power conversion, and environmental controls for cabins, cockpits and personnel compartments. All of our RTDs are based on contact type which is designed to measure temperature through direct touch with the material or liquid. Examples of contact type RTDs uses are measuring aircraft skin temperature, sensing temperature on an aircraft braking system or gauging cooling system temperatures for engines and transmissions. The construction of the RTD is very versatile, it construction will vary based on the surface area, the environmental factors and the connection to and from the point being measure. We have years of experience in integrating military type RTDs providing engineering support for most military applications and manufacture to a source control drawing (SCD). The typical military temperature sensor(s) we supply usually incorporate either a thermocouple or RTD type element. Occasionally, we have requirements for thermistor type elements, but thermistors are primarily used for commercial applications such as current-limiting devices, in-rush current limiters, battery packs, and the consumer appliance industry. 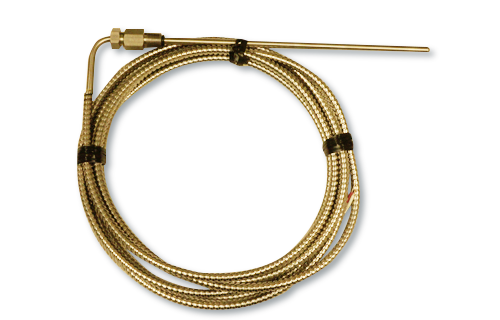 Thermocouples are very suitable for military temperature applications because they are robust and easy to use. However, if used at high temperatures for long periods of time, the thermoelectric coefficients change with time and the measurement voltage will decrease. The aging of thermocouples cause their conductors to lose homogeneity, thus impacting the relationship between the metals. The military uses thermocouples for sensing temperatures of diesel engines, gas turbines and transmissions, particularly suitable for applications where the temperature s exceeds 600⁰C. If your application is under 600⁰C, RTDs become a viable alternate. In addition, RTDS have a lower temperature range and are very appropriate for extremely cold conditions, high altitude and space environments. For any military temperature sensor applications, call C-Temp International to discuss options and solutions. We have been in the industry for over 30 years and can help determine the optimal temperature sensing solution for any military application.